The first nationally representative survey of laity in Eastern Orthdoox churches in the US finds a strong sense of religious identity among them as well as few major differences with clergy. Unlike many Protestant and Catholic churches, there were few sharp divisions over such issues as the ordination of women, according to Alexei Krindatch who conducted the study for the Patriarch Athenagoras Orthodox Institute of Berkeley, California. Celebration in the Russian Orthodox Cathedral in San Francisco (© 2006-2008 Religioscope). The study, entitled “The Orthodox Church Today,” was conducted among nearly 1,000 parishioners in 103 parishes of the Orthodox Church in America (OCA) and the Greek Orthodox Archdiocese, the largest Orthodox bodies in the US. The survey was presented by Krindatch at the October conference of the Society for the Scientific Study of Religion in Louisville, Kentucky, which Religioscope attended. The lack of wide differences between clergy and laity is most likely related to the basic unity on Orthodox doctrine and practices. 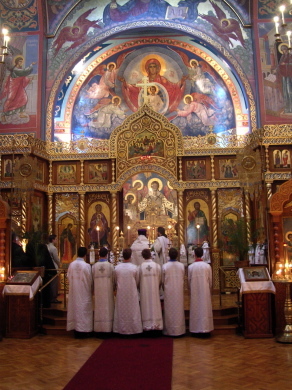 The vast majority of both clergy and laity identify their approach to church life as either “conservative” or “traditional.” Only a small percentage (about four percent) described themselves as “liberal,” and anywhere from 19 to 28 percent of clergy and lay respondents called themselves “moderates.” Yet very few (seven-eight percent) believed that the Orthodox Church was the only path to salvation. On the issue of women priests, only 14 percent of the Greek Orthodox laity and six percent of the OCA laity would agree with such an innovation. On the status of the priest, the laity were even more likely than the clergy themselves to recognizes the special status of the priesthood, preferring such a hierarchical (or what is called “cultic”) model to that of a more egalitarian “servant-leader.” The laity and the clergy almost equally agreed that the priest should have final authority in a parish. The laity valued the priesthood enough that three-quarters of respondents would encourage their sons to become priests. At the same time, a majority of laity (53 percent) said it was okay to disobey the priest on some matters. The survey did not find wide a “generation gap” on doctrine and practice. Studies have found substantial differences on adherence to church doctrine and Mass attendance among American Catholics in the baby boom (those born between 1947 and 1964) and pre- and post-baby boom generations, including priests (with the younger priests being more conservative on doctrine than older priests, while the younger laity are more liberal). In contrast, the Orthodox study found only minor and inconsistent generational differences that did not suggest firm lines of division, although, there was not enough data to look at “generation Y,” consisting of those in their 20s. The study did find that a large majority of Orthodox members were concerned about the ability to pass on the faith to the younger generations.